For years, the trend in Christian fiction has been to make books as ecumenical as possible. So when a church is mentioned, it's usually given a generic name that could fit almost any denomination. Debbie Viguié makes a bold move in The Lord is My Shepherd. Not only does she make her mystery-solving church secretary a Presbyterian, but then she pairs her up with the Rabbi from the temple next door. Together, Cindy and Jeremiah must unravel the clues leading them to a serial killer. As they are constantly thrown together, they forge a bond of trust and friendship that transcends their religious beliefs. Cindy’s church is getting ready to celebrate Easter, and Jeremiah’s Temple is preparing for Passover when Cindy literally stumbles over the body of an unknown man lying dead in the sanctuary. The church was locked, and a bloody cross necklace on the floor seems to be the only clue. The killer is likely a member of the congregation, but there are hints that similar deaths have happened in the past. Are Cindy and Jeremiah dealing with a serial killer? They have to unravel the clues before Easter Sunday arrives and more people die. Viguié's book packs a double whammy. First, it's a great mystery. As the clues unfolded and the tension increased, I found it harder and harder to put the book down to deal with my own real-life issues. Second, it's a wonderful story of two people from two very different backgrounds who discover that, at heart, they're not so different after all. The friendship that grows between Cindy and Jeremiah is very sweet, and what they learn about each other's faiths is illuminating. 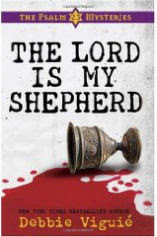 The Lord is My Shepherd is the first of The Psalm 23 Mysteries, so fans of this book will get to meet Cindy and Jeremiah again when I Shall Not Want comes out in Fall 2010. It will be interesting to see how Viguié handles the friendship between her Presbyterian secretary and the intriguing Rabbi. If it blooms into something more tinged with romance (which many readers will expect it to) there will be some controversial faith issues to deal with. But I'm confident this series will deliver in stellar fashion. Kudos to Viguié and to Abingon Press! NOTE: I received a copy of the book from the publisher for reviewing purposes. Well, now doesn't that sound interesting. I've got to get my hands on one of these. Thanks for the heads up, Jen. I know you've mentioned it before and I'm glad to know it's going to be a series. Hey, Anita, do you ever sleep? Hi Jen. I'm always looking for a good mystery series and this one sounds like it has a great twist. I really like the idea of the main characters having such different religious backgrounds. I'll be curious to see how she works it all out. Ohhhhhhhhhhhh. My kind of book. Now when am I going to find the time to read it? Jen, do you think it will be on CD? Thanks for sharing this with us today. Love it! That's quite a premise! It almost sounds like the starting line for a joke... "What do the Presbyterian church secretary and the rabbi have in common?" I'm with you Jill, I'm going to start having to get books on MP3. Maybe then I could bribe myself to clean the house. This one seems to cross some lines that spark my interest. Mystery set in a church with a eyebrow raising relationship. hmmmmmm. Hey gals, great to see you! I've been told that the Abingdon books will eventually be available as eBooks, but haven't heard anything about audio.